Owner Matthew Rick shows off Infinity Beverages' brandy, released earlier this year. 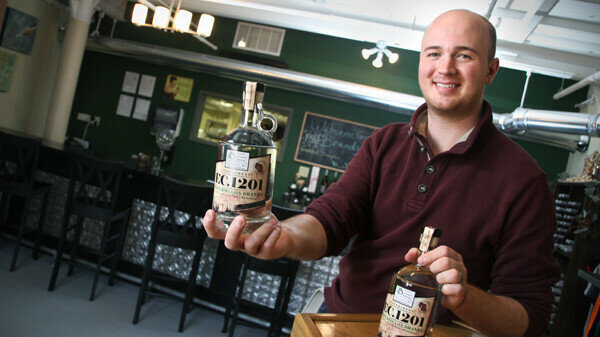 Wisconsin is home to a number of distilleries producing a variety of interesting spirits. Since 2006, the state seems to have taken strides a relatively new trend for Wisconsin culture – offering unique, high quality beverages focused on small batches. Following the lead of the craft beer brewing industry (not to mention independent wineries), Wisconsin distillers continue to produce appealing and flavorful spirits for locals and visitors. This season, Travel Wisconsin has recognized some of our state’s favorite distilleries – one being Eau Claire's own Infinity Beverages Artisan Winery & Distillery, known for its watermelon brandy, large wine selection, and its recent "beeriskey" announcement. Other distilleries included on the list offer drinks like toffee rum found at North Woods Distillery in Coleman, as well as a pumpkin seasonal spirit at Great Lakes Distillery in Milwaukee.